Park Avenue Perimeter Outriggers. Endless possibilities. 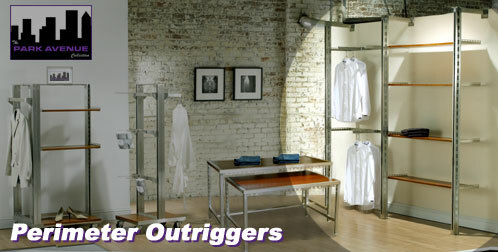 Start with the core outrigger system, then add the components you need to create your custom display. The Park Avenue System will transform your space and improve your sales! If you have any questions concerning our Park Avenue Display Collection or any other Palay Display Store Fixture Collection, please do not hesitate to call or chat online with one of our knowledgeable sales representatives. Palay Display has been leading the way in store fixtures and retail displays since 1945.